The United Nations is ready to get into the Syrian city of Raqqa after so-called Islamic State (IS) was driven out after three years. A UN official in Damascus told the BBC access to the area was the main priority while warning that some 300,000 people who had fled the city had "enormous" needs in nearby camps. Aid workers have said it may take years before they can return to their homes. A US-backed alliance of Syrian fighters says it has full control of the city. Operations were under way to uncover jihadist sleeper cells and remove landmines from the last areas of Raqqa, Syrian Democratic Forces (SDF) spokesman Mustefa Bali said. The four-month assault against IS destroyed Raqqa's civilian infrastructure and homes, humanitarian agencies say. Linda Tom, a UN official in the Syrian capital Damascus, said no civilians were believed to be in the city and the end of the battle for Raqqa was a "big change" for humanitarian workers. "If we're now in a better position to get to people who need assistance, we're ready to do it and we're ready to increase our assistance," she said. She added that aid groups were struggling to assist the thousands of civilians who were in dozens of displaced camps around Raqqa, and who were in urgent need of water, food and medicine. World Food Program Middle East Director Muhannad Hadi told AP news agency the defeat of IS in Raqqa was a "game-changer" for the work of humanitarian agencies. On Tuesday, aid group Save the Children warned the humanitarian crisis in north-eastern Syria was "rapidly escalating", with camps "bursting at the seams". "Most families have little or nothing to return home to and will likely be stuck in camps for months or years to come," the charity said in a statement. 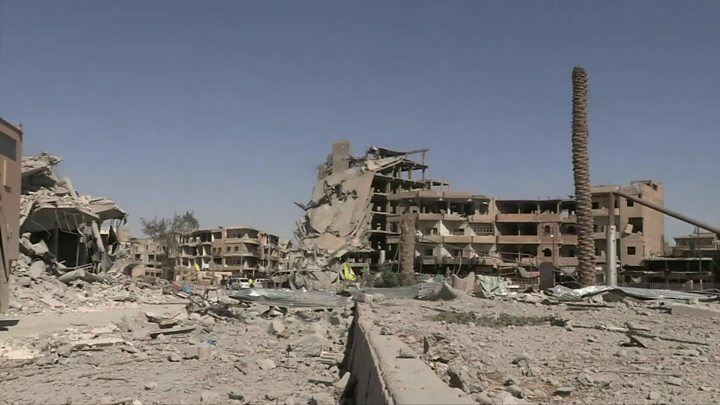 The SDF said on Tuesday it had taken Raqqa, a city where IS made the headquarters of its self-styled "caliphate" in early 2014, implementing an extreme interpretation of Islamic law and using beheadings, crucifixions and torture to terrorise residents who opposed its rule. However, the SDF and Syrian government forces have launched separate offensives in the province with the aim of taking control of a key crossing on the border with Iraq. The US-led coalition said on Tuesday that forces it supported had reclaimed 93,790 sq km (36,200 sq miles) of Iraqi and Syrian territory seized by IS in 2014, and freed 6.6 million people from jihadist control.